My fiancée and I love to play games of strength and skill at amusement parks, and we especially enjoy trying to win at the claw machine. Sure, we could buy a stuffed animal for $5 at Walmart, but what fun is that compared to spending $5 on a thrilling game and potentially winning a prize from a crane game? Memories are made and stories are created when the quarters and tokens start flying around games like the claw machine. Of course, we know that playing the claw machine, like the case with all arcade games, means taking a gamble. In fact, claw machines really are nothing more than slot machines that require a little bit of skill and a lot of luck. You may win sometimes, but you will lose a lot more often. We did our research (yes, we are that serious about trying to win at the claw machine) and learned that arcade game operators can set how often they want their claw machines to pay out. Using a command module setting (CMS), the operator can manipulate how many pounds per square inch (PSI) of pressure the claw will exert when grabbing a toy. Most claw machines employ a pressure of 5 to 8 PSI, and require 10 to 13 PSI to grab a typical toy. These pressures are, most often, manually determined, and can be set by adjusting the tension spring that controls the claw’s strength. How Often Can You Win At The Claw Machine? While you may think that the operator will rig the claw machine so you can never win, the reality is that state laws dictate how often claw machines must pay out. 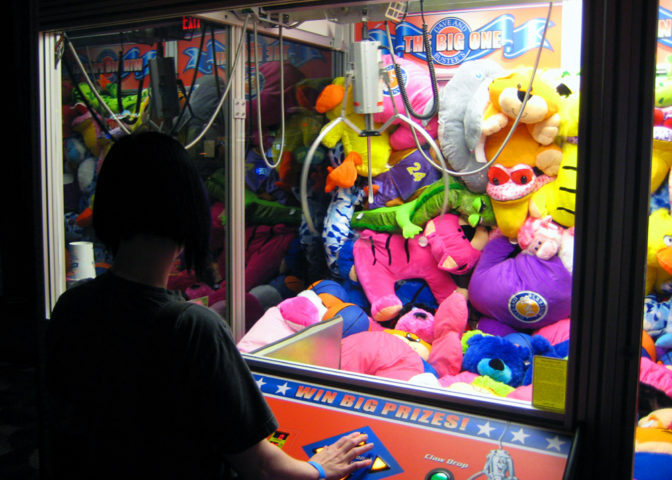 In California, for example, the claw in a crane game must use enough pressure to pick up a prize once in every 12 games. In Nevada (hello, Las Vegas! ), it’s 1 in every 15 games that a claw machine must surrender a prize. Certain types of claw machines even have a default setting that determines claw strength. 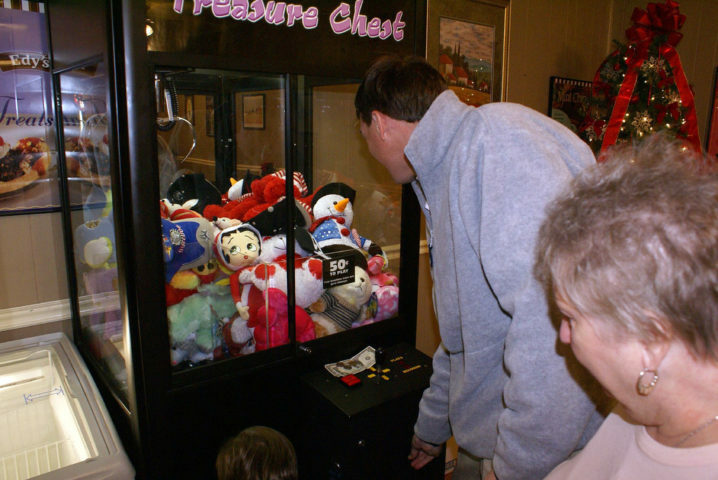 For example, Captain Claw crane machines assign default odds of 1/18 that the claw will be strong enough to successfully pick up and deposit a prize in the chute. There are even some crane games that initially grip a prize with sufficient strength for picking it up, but then weaken in pressure shortly after you get the toy in the claw – agonizing indeed. After learning about the various state regulations and the fact that operators control the odds of winning at specific crane games, we decided to try out a claw game at an amusement park in Tampa, Florida. After all, we wanted to do some empirical experimentation on the matter of how often one really can win at a claw machine. We made 19 attempts at the Tampa claw machine, with 15 grabs (this machine weakened its claw’s strength shortly after picking up a toy) and exactly 1 successful deposit into the chute. We scored on the 17th attempt, with 2 more attempts after the win. We used teamwork to win at the claw machine. One of us would help the other align the claw over the prize correctly before telling the other when and where to hit the drop button. We took aim at a purple hippopotamus (it was around Christmas… and she wanted a hippopotamus), focusing on putting the claw around the hippo hero’s rump or head and trying to wrap the claw around at least one of the stuffed animal’s legs. Dolls that were placed too close to the windows were much harder to grab. We learned that you can win at the claw machine if you play often enough and are able to position the claw correctly on each play. Given those factors, you should usually win a prize within 20 to 30 attempts, based on the randomization of the machine and what state’s regulations the machine falls under. We ended up adopting the purple hippopotamus and named it “Chrissy” (for Christmas). We’ve got quite a story to tell, too. Not a bad way to spend less than $20!